Video Game Sound Converter, or VGSC, is a program that can convert a range of video game audio formats to WAV. The conversion is actually handled by vgmstream, however VGSC wraps it with a simple UI and allows you to convert multiple files quickly and easily. It is occasionally updated with the latest version of vgmstream, although only if the rest of the program is changed or the vgmstream release is significant enough. VGSC is available for download here (Windows only). It is made by Puggsoy, a member of the VG Resource. VGSC supports a large number of file types. This is the compatibility list copied from the vgmstream readme. Keep in mind that just because a file has an extension does not necessarily mean that it is in that format. However if a file extracted from a console has an extension listed under that console, it is likely that VGSC can convert it. If you start VGSC by double-clicking on the executable (or through the command-line with no arguments) a file dialog will appear. In here, select the files you wish to convert. A folder dialog will appear, where you choose which folder the converted files will be saved in (this folder must exist beforehand). 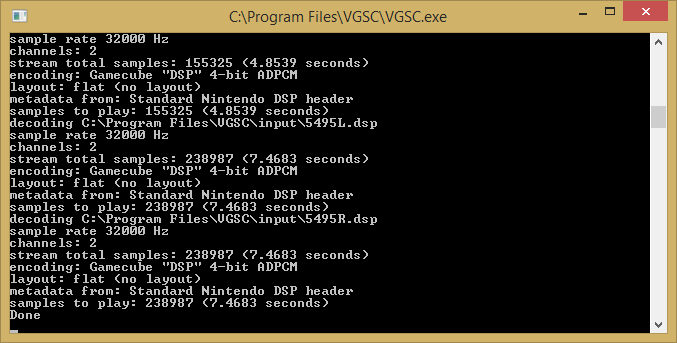 VGSC can also be run using the command-line. Again, outDir must already exist. If the files cannot be converted, you will see "failed opening" errors. In this case, the files are most likely incompatible. This page was last edited on 9 August 2014, at 20:43.